In a racing race, one need slow down when there is a corner. However, after the car with turbo loose the throttle, the engine speed drops, and can't drive the turbine. Thus, one can only re-oil and push the turbine up after passing the corner. But the problem is that the turbine's hysteresis is so obvious that the acceleration of the car is reduced. To solve this problem, some car factories invented the "partial ignition" technology, which means that the car keep providing fuel to the cylinder, but not the igniting. By doing this, the gasoline will remain misty, and then get into the exhaust system. Once the misty gasoline get into the high-temperatured exhaust pipe, there will be an explosion and strong flames sprayed in the tail throat. This will keep the turbine at a high speed and avoid the lag. Over time, the original silver tail throat becomes flaming blue in hot baking. What kind of changes of installing a car exhaust muffler pipe can bring us? 2, Protect the original car exhaust pipe, save your money. There is no need to spend extra money to change the tail pipe any more. 1, This exhaust muffler pipe fits most of the cars whose original tailpipe's diameter is 1.6 to 2.75" (4 to 7 centimeter) . 2, Please check your original tailpipe's type before purchase. Straight tailpipe is for straight type, and curved tailpipe is for curved type. 3, installation: Fix this tailpipe to the appropriate location of the original tailpipe using our accessary screws. 【 Note 1 】This Tip Fits Pipes From 1 3/4 inch to 2 3/4 inch pipe Diameter. Please Measure Your Pipe Diameter. 【 Note 2 】Please remember check your original tailpipe's type. Straight tailpipe is for straight type, and curved tailpipe is for curved type. 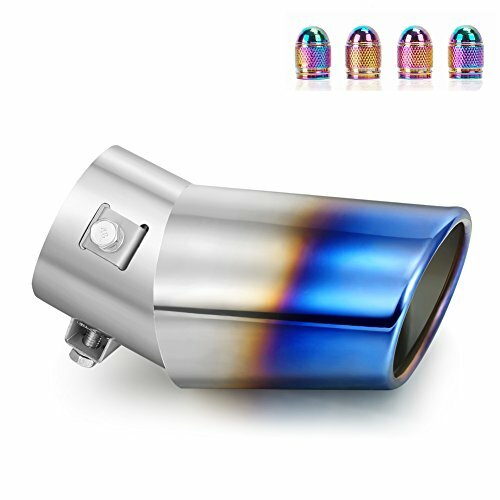 【 Note 3 】View product details image,Understand the installation and size of the product, can view the other seven exhaust pipe products,Choose the right product size and your favorite color. 【Easy to Install】 There is no need to replace any parts,No weld needed. No drill needed.Super Easy to Install! Three Bolt Fit the tip to your Pipe. 【Car Decoration】Surface polishing + Grilled blue process. Exquisite workmanship, shiny bright and cool colors.Extra 4Pcs colorful car tire valve stem caps as gift. If you have any questions about this product by DSYCAR, contact us by completing and submitting the form below. If you are looking for a specif part number, please include it with your message.